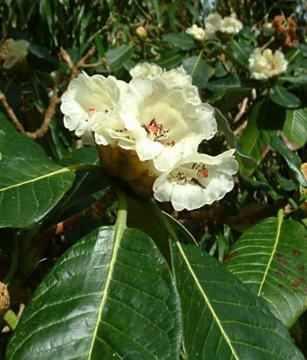 Large, rounded, evergreen shrub or small tree. Large, bold, conspicuously veined, glossy dark green leaves, up to 30cm long and felty grey on the undersides. Trusses of bell-shaped, pale yellow flowers with purple blotches inside, in March and April. Moist, well drained humus rich acid soil. Sheltered location with lime-free soil.